Founded in 40 years of early childhood experience and run by highly qualified staff, Kalparrin’s Education and Training Program is renowned within the early childhood and education sector. 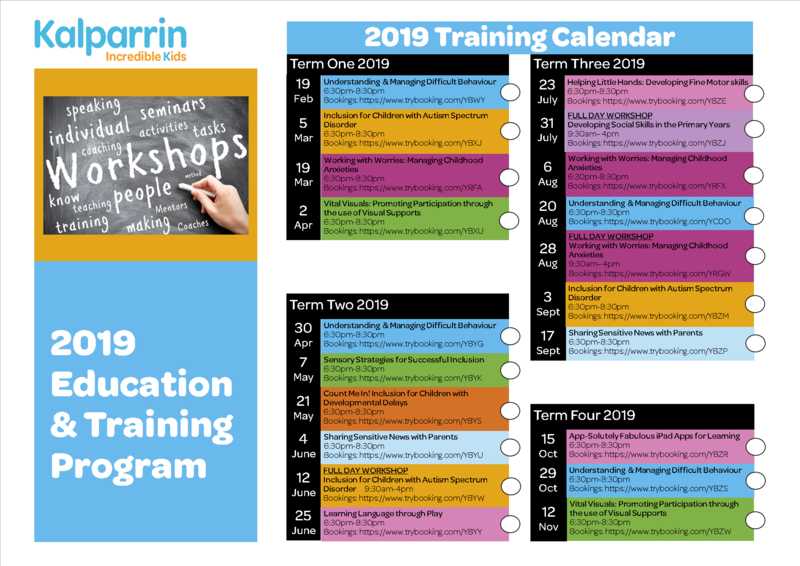 Kalparrin’s 2019 Education and Training Calendar outlines the extensive range of calendared workshops on offer. Kalparrin’s Education and Training Program is highly regarded and workshops book out quickly, so ensure you register early. To attend a Workshop simply download the current 2019 Education and Training Calendar, choose your preferred Workshop and register online through TryBooking. This is run on a fee for program basis.